The shift from incurred to expected loss provisioning under IFRS 9 is one of the most important changes in the history of financial reporting of banks, and materially alters the way banks value loans and calculate credit loss provisions. This column outlines the major changes and associated implementation challenges and identifies steps that market participants and supervisors can take to facilitate high-quality implementation of the accounting standard. In 2009, during the London summit of the G20 that coincided with the worst of the Global Crisis, leaders called for “the accounting standard setters to work urgently with supervisors and regulators to improve standards on valuation and provisioning”. This extraordinary communiqué from G20 leaders on what some would have assumed were arcane accounting issues reflected the growing perception that the accounting standard for financial instruments in effect at the time – International Accounting Standards (IAS) 39 – played a role in contributing to, and exacerbating, the crisis that began in 2007. IAS 39 limited the ability of banks to recognise loan loss provisions ahead of credit default. This contributed to the criticism that it was procyclical, and that provisioning requirements were ‘too little, too late’. In response, the International Accounting Standards Board (IASB) issued International Financial Reporting Standards (IFRS) 9, which became effective on 1 January 2018. IFRS 9 requires banks to estimate provisions based on expected rather than incurred losses, and is a welcome development for prudential authorities. It should lead to the build-up of credit loss provisions earlier in the credit cycle, enhancing the loss-absorption capacity of banks going into a downturn. At the same time, IFRS 9 raises implementation challenges that have prudential implications. How do banks value loans and other financial instruments that are not subject to ‘mark-to-market’ accounting? Do the valuation methods provide market participants with an accurate picture of a bank’s credit risk profile and overall financial condition? What specific changes to asset and loan valuations are required under IFRS 9? Do these valuation changes have prudential implications? The answers to these questions are enormously consequential for financial stability, given that inflated loan values undermine the integrity of reported earnings and solvency measures of banks. In a recent paper (Restoy and Zamil 2017), we highlight the key differences between IAS 39 and IFRS 9, outline the major IFRS 9 implementation challenges and their prudential and financial stability implications, and identify policy considerations for authorities that have adopted (or plan to adopt) IFRS 9. IFRS 9 is a major improvement on IAS 39 and addresses two significant weaknesses of the prior standard: it eliminates the loss event threshold to trigger the recognition of credit losses, and it also requires entities to consider future events and forecasts in determining credit loss provisions. IFRS 9 also requires entities to place financial instruments into one of three distinct risk buckets. Under IAS 39 they were designated as "Impaired" or "Unimpaired". Under IFRS 9 they are now designated as “Performing” (Stage 1), “Underperforming” (Stage 2) or “Non-performing” (Stage 3), as in Figure 1. For loans in the Stage 1 category, provisions are required based on 12-month expected losses (that is,the probability of default over the next 12 months multiplied by the loss if they default). Once a loan has experienced a “significant increase in credit risk”, it should be moved to Stage 2, with provisions being recognised on lifetime expected losses (in this case, the probability of default over the remaining life of the loan multiplied by loss given default). Estimated provisions for Stage 3 loans are also based on lifetime losses, though the probability of default calculation – since Stage 3 loans by definition are non-performing – is likely to be higher than Stage 2 loans and should generally result in higher provisions. Estimating provisions for Stage 1 loans: Many banks may not have sufficient historical loss data to support their credit loss estimates. 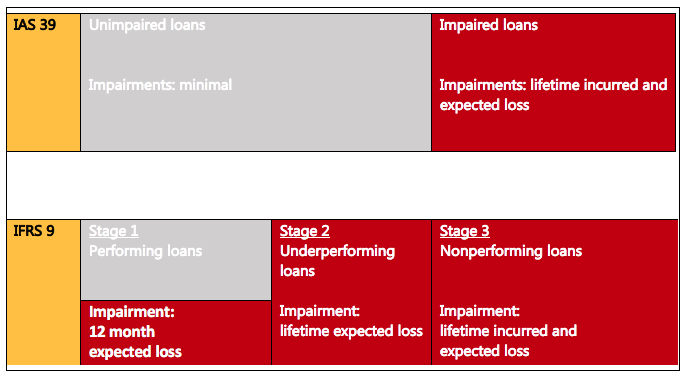 Determining when to reclassify loans from Stage 1 to Stage 2: The timing of when a loan is reclassified from Stage 1 to Stage 2 can materially influence the level of provisions held at any point in time, since Stage 1 loans require provisions based on 12-month expected losses, while Stage 2 loans require lifetime expected losses. The difficulty arises because reclassification of loans to Stage 2 is driven by whether there has been "a significant increase in credit risk". This term is not explicitly defined in the standard. Using forward-looking information: The type of forwarding-looking information used, the time horizon (how far to look into the future), and how the information will be integrated in setting provisions are likely to vary across banks and jurisdictions. Under Basel III, banks are provided with a menu of approaches to calculate their credit risk capital requirements for unexpected losses. They range from a simple standardised approach to more complex internal-models-based approaches (BCBS 2017). Most banks apply the standardised approach, in which supervisors provide all the inputs for banks to calculate their regulatory capital requirements for credit risk. Under this approach, banks cannot use internal models to calculate regulatory capital requirements. If supervisors allow a bank to use an internal ratings-based (IRB) approach, the bank can use its internal models to estimate credit risk capital requirements. There are two main IRB approaches: Foundation IRB (F-IRB) and Advanced IRB (A-IRB). Under A-IRB, banks have more discretion to estimate credit risk parameters than under F-IRB, though this discretion is subject to certain modelling constraints. Supervisors typically will grant approval for the IRB approaches only to the largest and most sophisticated banks, on the basis that they have the capacity to develop and maintain reliable models to measure credit risk. In contrast, IFRS 9 provides a one-size fits all approach. It requires all banks to use their internal models to calculate expected credit losses. The implications of these divergent approaches are clear. The level of judgement required to estimate IFRS 9 provisions is analogous to granting blanket supervisory approval to all banks to apply an unconstrained A-IRB approach to calculating their credit risk capital requirements. This would not be allowed for even the most sophisticated global banks under Basel III. Given the potential for banks to ‘game’ credit risk models (BCBS 2013), the implementation of IFRS 9 may lead to vastly different provisioning outcomes, which could result in unwarranted divergence of their reported earnings and Basel III capital measures. Banks must develop a credible methodology to derive expected credit losses and arrive at plausible credit loss estimates under the new standard. Market participants need to have confidence in banks’ reported provisioning estimates and, by extension, their disclosed earnings and regulatory capital levels. The loss of market credibility can result in undesirable financial consequences that might be difficult to reverse. Alongside audit firms and their watchdogs, accounting and audit standard-setting bodies should continue to take tangible steps to facilitate a high-quality implementation of IFRS 9. The IASB, the International Auditing and Assurance Standards Board, and audit firms have introduced, or are in the process of introducing, a number of initiatives to foster robust implementation. Only time will tell if these initiatives can be effective, once the cumulative experience gained with the application of IFRS 9 and its audits becomes apparent. Supervisory authorities will also play an important role in the implementation of IFRS 9. As a starting point, authorities may consider issuing guidance for small and large banks on their expectations for the implementation of IFRS 9 focusing, among other topics, on areas in which the standard is either silent or vague (for example, what a 'significant' increase in credit risk would be). For this, guidance from the Basel Committee (BCBS 2015) outlines its views on the appropriate application of IFRS 9 that may be a useful reference for supervisory authorities. In addition, supervisory authorities may need to consider whether IFRS 9 provisions should be supplemented with prudential backstops. These have been used under IAS 39 in many jurisdictions,1 and the question for policymakers is whether there remains a need to introduce, retain, or modify them under IFRS 9. If they are used, there is a balance to be struck between providing appropriate incentives for banks to build credible expected credit loss provisioning models, and ensuring that a sufficient level of prudential provisions are accounted for, at least in the calculation of regulatory capital. Bob Dylan once sang that: "He that gets hurt will be he who has stalled... It’ll soon shake your windows and rattle your walls. For the times they are a-changin’." The introduction of IFRS 9 is perhaps the most consequential change in the history of bank financial reporting, and it provides all parties with a unique opportunity to better account for how loans are valued and reflected on bank balance sheets. This, in turn, can foster greater confidence in bank solvency measures, and help to underpin trust in the financial system. Authors’ note: The views expressed in this column are those of the authors and do not necessarily represent the views of the Bank for International Settlements or the Basel-based standard setters. Barclays Equity Research (2015), "Re-visioning provisioning". Basel Committee on Banking Supervision (2017), "Finalising Basel III – in brief". Basel Committee on Banking Supervision (2013), "Analysis of risk-weighted assets for credit risk in the banking book". Basel Committee on Banking Supervision (2015), "Guidance on credit risk and accounting for expected credit losses". Financial Stability Board (2009), "Declaration on strengthening the financial system", London Summit, April. International Accounting Standards Board (2014), IFRS 9 Financial Instruments. Restoy, F and R Zamil (2017), “Prudential policy considerations under expected loss provisioning: lessons from Asia”, FSI Insights on policy implementation no 5, October. While there is a globally harmonised regulatory backstop in place for all IRB banks, that backstop was developed when accounting was under the incurred loss approach to provisioning under IAS 39. As the parameters that drive model outcome under IFRS 9 has changed, the prudential regulatory backstop currently in place may require revisions to ensure it remains fit for purpose. Many authorities in Asia and Latin America have also imposed regulatory provisioning backstops for banks under the standardised approach to credit risk capital measurement.